Launched at the 1962 Earls Court Motor Show, the MGB went on to become the world’s best-selling sports car (A record it held for nearly 20 years), with over half a million produced over its 18 year production. Replacing the popular MGA wasn’t easy but the MGB was easier to live with, drive and dynamically a big step forward. Under the bonnet was an upgraded 1.8 litre B-series engine, producing 95bhp and giving the ‘B’ a top speed of over 100mph. The 4-speed gearbox (with optional overdrive) put the power through the rear wheels. While up front there was independent front suspension, rack and pinion steering and front disc brakes. Launched first as a 2-seat convertible. A pretty coupe, the MGB GT, followed in 1965. The GT was a genuine mini Grand Tourer, its sleek roofline designed by Italian styling giants Pininfarina. With larger windscreen and side windows, improved headroom in the front and small seats in the back, the MGB GT offered a touch of extra civility. The Mk2 was launched in 1967. The four-speed gearbox now had synchromesh on all forward gears and there was the option of an automatic gearbox. Few buyers, perhaps unsurprisingly, ticked the auto option but MGB-Auto fans say the self-shifter suits the B’s relaxed character well. In 1970 the Mk3 MGB received a BL-family nose-job, replacing the beloved chrome grille with black slats. MG fans disapproval forced BL to revert to the chrome grille soon after. Less controversial improvements, apart from a few minor exterior changes, revolved around the interior – revised air vents on the dashboard, a smaller 3-spoke steering wheel and reclining vinyl seats. 1974 North American crash regulations did away with the chrome grille once and for all as dreaded polyurethane impact bumpers were fitted front and rear. A worse crime arguably was that to meet the regulations, and avoid a costly re-styling, MG’s engineers had to raise the car’s suspension by an inch, which didn’t benefit the cars handling one bit. In 1967 the MGC was launched (as a coupe and convertible) with a re-worked version of the Healey six-cylinder. It wasn’t a popular choice and just 9002 were made before production ended in 1969. Another attempt to make a more powerful MGB was 1973’s MGB GTV8. The Buick-derived Rover V8 was slotted into the BGT (no convertible available). The low-tuned 137bhp V8 was reliable and made the right sound but just 2591 MGB GTV8’s were sold before production ended in August 1976. In 1992, 12 years after MGB production had ended, MG Rover launched the RV8, built around a heavily updated version of the MGB’s bodyshell. More luxurious and thanks to the Land Rover sourced, 190bhp 3.9 litre V8, powerful. The car wasn’t intended to sell in big numbers and just 1982 RV8’s were built in 3 years of production (the majority of which went to Japan – though many have since returned to the UK). Production ends…The end of the MGB? On 22nd October 1980, after more than eighteen years and with over half a million cars produced, MGB production came to an end. Although the end for the MGB wasn’t the end in the usual sense, the car was always popular with MG and classic car fans and an MGB still makes an excellent choice of classic sports car today. They’re cheap to run, have excellent specialists, clubs and fantastic parts availability (British Motor Heritage even sell a replacement bodyshell). 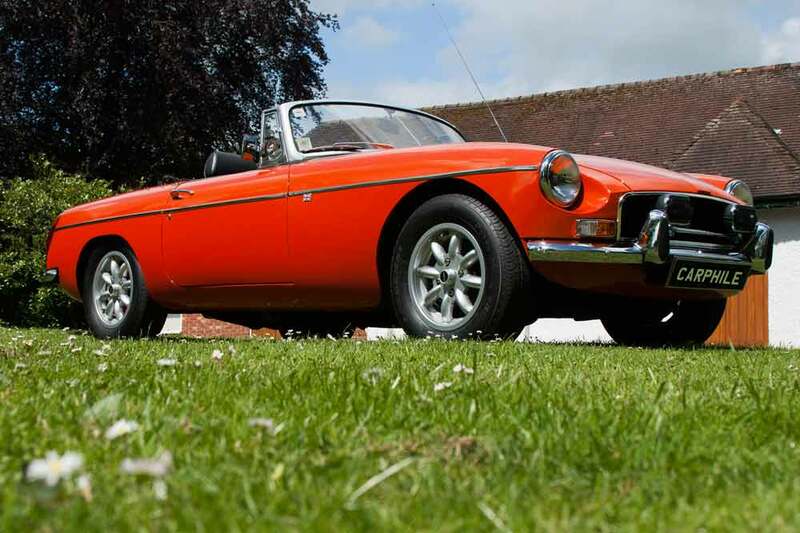 Find out what it’s like to own an MGB today.